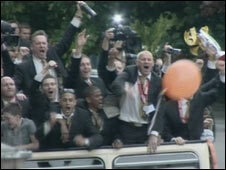 Hull City have celebrated their promotion to the Premier League with an open top bus tour around the city. The club will play in the top flight for the first time in its 104-year history after Dean Windass scored a winner against Bristol City at Wembley. The bus tour started from the club's KC Stadium at 1400 BST before doing a lap of honour around the city centre. Players and club staff greeted tens of thousands of fans at a celebration in Queen Victoria Square. Banners celebrating the club's promotion appeared among the crowd as the team showed off their trophy. Chants of "we are going up" were sung by fans as the trophy was lifted in the city centre by manager Phil Brown. A firework display is due to take place across the city later. Speaking during the celebration on the balcony of City Hall, player Fraizer Campbell - on loan from Manchester United - said: "It's great to see all the fans out here, they deserve it - the Premiership, here we come. "The fans have been fantastic all season." After Saturday's match Windass, 39, said of his goal: "It feels unbelievable. I don't think there is anyone left in Hull today, looking at how many supporters we've got here. "To score the wining goal is fantastic. We've worked hard from the start of the season and we've got our rewards." Calls are now growing for the Hull-born striker to be honoured by the city. Doreen Windass, the striker's mother, said: "I'm just on cloud nine - so proud... and I knew that he'd end up at Wembley and, well, I'm 50 foot tall, I'm so proud!" Carl Minns, leader of Hull City Council, also suggested there may be plans for a permanent tribute to the footballing hero.